Don't mumble, be short, loud and clear so everyone can hear you. If using a microphone make sure you know how it works. As a women: To be safe, use waterproof mascara for your wedding day. You never know how emotional you will be during the actual event and you certainly don’t want black tears rolling down your face if you cry. 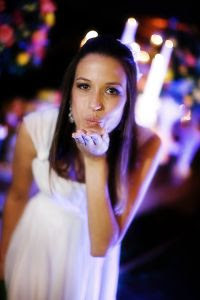 Many people, including your wedding guests, could be sensitive to perfumes, so try using scented body powder instead. To entertain your guests at the reception before you arrive, make up a fun quiz of "get to know us better" bride and groom trivia. The wedding video should be focussed about the bride and groom. This is the most basic (and most important) tip of all. Keep in mind what they want. Get as many shots of them as you can holding hands at the rehearsal, when they first see each other at the ceremony, walking out together after the vows, the little looks they give each other at the reception, laughing, dancing and enjoying the spotlight. And: Keep the theme of the wedding in mind.